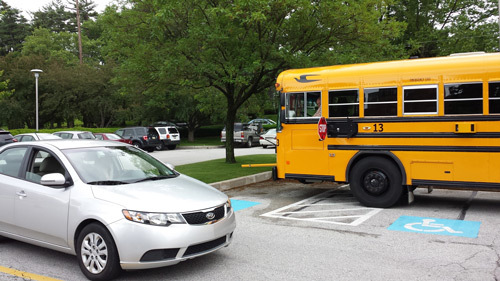 During a demonstration Thursday, June 5, a car passes a school bus equipped with a camera designed to capture evidence of motorists illegally passing school buses. House Bill 1580, authored by Rep. Seth Grove (R-York), would allow for the use of such cameras by school districts and bus companies. YORK – Rep. Seth Grove (R-York) today addressed members of the House Transportation Subcommittee on Transportation Safety regarding House Bill 1580. This bill, which Grove authored, would give school districts and bus companies the option to install automatic cameras, designed to capture evidence of motorists passing the bus illegally. Under current law, the penalty for passing a school bus illegally is a fine and a 60-day driver license suspension. However, the burden of proof is on the bus driver, who must report the motorist’s license plate number and details of the incident to the police. Under Grove’s bill, photo evidence of a violation will be passed along to a district’s area police department. Officers will review the photos to determine if sufficient evidence exists to issue a violation. If this bill is signed into law, the fine for a violation will increase to $250. The possibility of a license suspension will remain but will require further evidence beyond the photos. Money from fines will first be used to pay for the cost implementing the devices, and then to fund driver’s education for students. “It is my hope that the use and enforcement of these new rules act as a deterrent and increase the ability of school districts and police departments to crack down on this practice,” Grove added.